STS-82 was the 22nd flight of the Space Shuttle Discovery and the 82nd mission of the Space Shuttle program. It was NASA's second mission to service the Hubble Space Telescope, during which Discovery's crew repaired and upgraded the telescope's scientific instruments, increasing its research capabilities and achieved the highest altitude ever attained by a STS Orbiter (335-nautical-mile (620 km)). Discovery launched from Kennedy Space Center, Florida, on 11 February 1997, returning to Earth on 21 February 1997 at Kennedy Space Center. On the third day of the mission, Discovery's seven-member crew conducted the first of four spacewalks (also called Extra-vehicular Activities or "EVAs") to remove two older instruments and install two new astronomy instruments, as well as perform other servicing tasks. The two older instruments being replaced were the Goddard High Resolution Spectrograph and the Faint Object Spectrograph, exchanged for the Space Telescope Imaging Spectrograph (STIS) and the Near Infrared Camera and Multi-Object Spectrometer (NICMOS), respectively. In addition to installing the new instruments, astronauts replaced other existing hardware with upgrades and spares. Hubble received a refurbished Fine Guidance Sensor, an optical device used to provide pointing information for the telescope and as a scientific instrument for astrometric science. The Solid State Recorder (SSR) replaced one of HST's reel-to-reel tape recorders. The SSR provides much more flexibility than a reel-to-reel recorder and can store ten times more data. One of Hubble's four Reaction Wheel Assemblies (RWA) -- part of the telescope's Pointing Control Subsystem—was replaced with a refurbished spare. The RWAs use angular momentum to move and maintain the telescope in a desired position. The wheel axes are oriented so that the telescope can provide science with only three wheels operating, if required. Study of the returned mechanism provided a rare opportunity to study equipment that had undergone long-term service (7 years) in space, particularly for the effects of vacuum on lubricants which were found to be in 'excellent condition'. Joseph Tanner performing maintenance on the Hubble Space Telescope. STS-82 demonstrated anew the capability of the Space Shuttle to service orbiting spacecraft. Discovery's crew completed servicing and upgrading of the Hubble Space Telescope during four planned EVAs, later performing a fifth unscheduled space walk to repair insulation on the telescope. HST deployed in April 1990 during STS-31. It was designed to undergo periodic servicing and upgrading over its 15-year lifespan, with first servicing performed during STS-61 in December 1993. Hawley, who originally deployed the telescope, operated the orbiter Remote Manipulator System arm on STS-82 to retrieve HST for second servicing at 3:34 am EST, 13 Feb., and positioned it above Discovery's payload bay less than half an hour later. Relying on more than 150 tools and crew aids, Lee and Smith performed EVAs 1, 3 and 5, with Harbaugh and Tanner performing EVAs 2 and 4. EVA 1 began at 11:34 pm EST, 13 February, and lasted six hours, 42 minutes. One of Hubble's solar arrays was unexpectedly disturbed by a gust of air from Discovery's airlock when it was depressurized, but was not damaged. 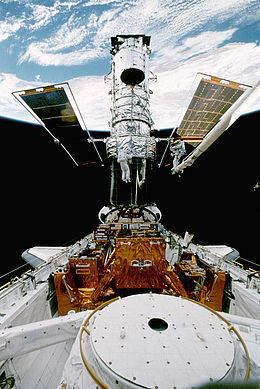 Lee and Smith removed two scientific instruments from Hubble, the Goddard High Resolution Spectrograph (GHRS) and Faint Object Spectrograph (FOS), and replaced them with the Space Telescope Imaging Spectrograph (STIS) and Near Infrared Camera and Multi-Object Spectrometer (NICMOS), respectively. STIS expected to shed further light on supermassive black holes. NICMOS features more capable infrared detectors and gave astronomers their first clear view of the universe at near infrared wavelengths between 0.8 and 2.5 micrometers. EVA 2 began at 10:25 pm, 14 February, and lasted seven hours, 27 minutes. Harbaugh and Tanner replaced a degraded Fine Guidance Sensor and a failed Engineering and Science Tape Recorder with new spares. Also installed was a new unit called the Optical Control Electronics Enhancement Kit, which further increased the capability of the Fine Guidance Sensor. During this EVA astronauts noted cracking and wear on thermal insulation on the side of HST facing sun and in the direction of travel. EVA 3 began at 9:53 pm, 15 February, and lasted seven hours, 11 minutes. Lee and Smith removed and replaced a Data Interface Unit on Hubble, as well as a reel-to-reel Engineering and Science Tape Recorder with a new digital Solid State Recorder (SSR) that allowed simultaneous recording and playback of data. Also changed out was one of four Reaction Wheel Assembly units that use spin momentum to move telescope toward a target and maintain it in a stable position. After this EVA, mission managers decided to add EVA 5 to repair the thermal insulation on HST. EVA 4 began at 10:45 pm, 16 February, and lasted six hours, 34 minutes. Harbaugh and Tanner replaced a Solar Array Drive Electronics package which controls the positioning of Hubble's solar arrays. Also replaced covers over Hubble's magnetometers and placed thermal blankets of multi-layer material over two areas of degraded insulation around the light shield portion of the telescope just below the top of the observatory. Meanwhile, inside Discovery Horowitz and Lee worked on the middeck to fabricate new insulation blankets for HST. Final space walk, EVA 5, lasted five hours, 17 minutes. Lee and Smith attached several thermal insulation blankets to three equipment compartments at the top of the Support Systems Module section of the telescope which contain key data processing, electronics and scientific instrument telemetry packages. STS-82 EVA total of 33 hours, 11 minutes is about two hours shy of total EVA time recorded on first servicing mission. Discovery's maneuvering jets fired several times during mission to reboost telescope's orbit by eight nautical miles. Hubble was redeployed on 19 February at 1:41 am, at the highest altitude both it, and a STS Orbiter ever reached, a 335-nautical-mile (620 km) by 321-nautical-mile (594 km) orbit. Initial checkout of new instruments and equipment during mission showed all were performing nominally. Calibration of the two new science instruments took place over a period of several weeks, with first images and data anticipated in about eight to ten weeks. Day 7 "Shiny Happy People" R.E.M. ^ a b c d e "STS-82 (82)". National Aeronautics and Space Administration. Retrieved 25 December 2011. ^ a b c d e f g h "Nasa - STS-82". National Aeronautics and Space Administration. Retrieved 25 December 2011. ^ a b Carré, D. J.; Bertrand, P. A. (1999). "Analysis of Hubble Space Telescope Reaction Wheel Lubricant". Journal of Spacecraft and Rockets. 36 (1): 109–113. Bibcode:1999JSpRo..36..109C. doi:10.2514/2.3422. ^ a b Fries, Colin (25 June 2007). "Chronology of Wakeup Calls" (PDF). NASA. Retrieved 13 August 2007. This page is based on the Wikipedia article STS-82; it is used under the Creative Commons Attribution-ShareAlike 3.0 Unported License (CC-BY-SA). You may redistribute it, verbatim or modified, providing that you comply with the terms of the CC-BY-SA.